Welcome to my homepage. This is where you'll find out all you ever wanted to know about me, and maybe even more. This is me, intrepid Andean explorer, famous writer, international bon vivant. Bill Crider is "one of the most unpretentious and versatile pure entertainers in the mystery field." 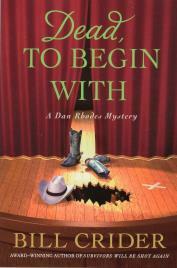 A Mammoth Murder: "Brisk and funny dialogue propels Crider's diverting 13th mystery to feature Texas Sheriff Dan Rhodes (after 2003'sRed, White, and Blue Murder). . . . Fans and newcomers alike will enjoy this playful romp with a Texas drawl". A Bond with Death: Bill Crider...writes two entertaining mystery series about his friends and colleagues.... In his third book about small-town English professor Sally Good, Crider links the murder of a campus troublemaker with Good's late husband, supposedly related to a Salem witch. As clean and sharp as a fine Bowie knife. Crider's prose slices through conventions and expectations to produce an enjoyable read, no matter what state you're in. university, leavening his characteristically tart plot with humor and a simmering sense of the absurd. An unerringly enjoyable mystery. For pure fun and sheer entertainment, it doesn't get much better than Crider's Tru Smith stories. Highly recommended. Infused in an artfully crafted murder plot is Crider's unique sense of humor, tautly drawn characters, and credible dialogue.
. . . a tight plot filled with laconic charm and idiosyncratic characters. The eighth Dan Rhodes mystery is a keeper. The humor, the suspense, and the small-town ambience all ring true. I've reviewed this series so often that I take for granted and perhaps forget to mention the quality of the writing. It's tops. Crider makes it look and feel effortless. He's a terrific storyteller and that's what makes his books so remarkable. If you like a little laughter in your mysteries, don't miss Bill Crider's works. Click Here to order my audio books. VJ Books has signed copies. Looking for a book club? Click here. Order e-books by Jack MacLane! Over on the left is my latest book from St. Martin's Press. You can buy a copy here. Or if you prefer the Kindle version, it's right here. You can order my books here. Here's what Booklist has to say: "The twenty-fourth Dan Rhodes mystery reprises the series’ best qualities: sharp plotting, an omnipresent sense of humor, and a wry, self-aware protagonist. Rhodes understands people, small-town folks most of all. Insults and love affairs are never forgotten, just buried in very shallow graves."